Â¬Â Â Â Use DCAA compliant software.Â These software packages will keep everything at hand and make sure that all needed reports are developed. Â¬Â Â Â Hire a consultant to guide you through the DCAA Accounting System Review.Â This will prove beneficial from day one of your contract to the completion. Â¬Â Â Â Make sure your employees are trained and knowledgeable of not only the procedures and process of dealing with timesheets but also what is expected by the DCAA.Â Make sure employee leave is authorized and well tracked. Â¬Â Â Â Track all types of expenses meticulously and keep all direct and indirect cost and allowable and unallowable expenses completely separate. Â¬Â Â Â Make sure each report reconciles with other reports.Â Check for errors and fraud and waste â€“ the DCAA will. 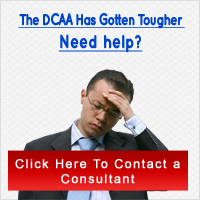 Remember, being prepared is an important aspect when dealing with the DCAA and successful fulfilling and winning another contract.Â Do not underestimate the importance of the timesheet; the DCAA expects the timesheet to be thorough, complete, and free of error.